All of a sudden water was everywhere, like a giant river sweeping everything away. Many people lost their homes and everything in them. Some people even lost their lives. The Solomon Islands Mission was established in 1914. It was officially organized in 1950 and reorganized in 1964 and 2006. There are 186 Seventh-day Adventist churches in the Solomon Islands. 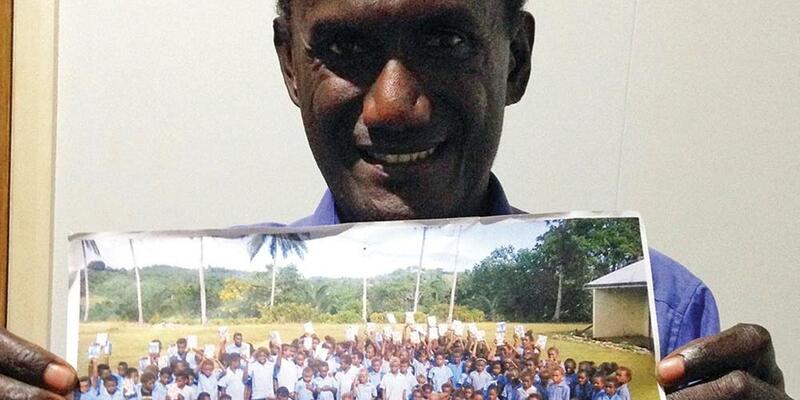 The Adventist membership in the Solomon Islands is 46,677. The Solomon Islands have two Adventist Colleges—Betikama Adventist College in Honiara and Kukudu Adventist College in the Western Province. The Solomon Islands is a country of several small tropical islands in the South Pacific. Sometimes it rains a lot in these islands, and at times so hard that it causes flash flooding. That’s what happened in the village of Ngalitatae (Nig-a LEE-ta-tay). All of a sudden water was everywhere, like a giant river sweeping everything away. Many people lost their homes and everything in them. Some people even lost their lives. The Adventists from the church in the nearby village of Varamata were the first ones to go and help the people of Ngalitatae. They needed food and clothing. Some of the children were naked because the flood had swept away their clothes. Besides this, the people needed to hear about Jesus and His love for them. So the Adventists held cottage meetings in some of the homes that didn’t get swept away, and the people came. At the end of the meetings, many villagers accepted Jesus as their Savior. At that time, the nearby Adventist church didn’t have any special programs for the children of Ngalitatae, so they talked and prayed about what they could do. As an answer to their prayers, a teacher named Mr. Brave Unikana came to the village school, and a branch Sabbath School was started. Each week, a tarpaulin was set up beside Mr. Unikana’s house. Many children came for the branch Sabbath School and sat on the ground under the shade of the tarpaulin. But when it rained the branch Sabbath School had to be canceled because the ground became very muddy. Sarah also enjoys the Bible stories and eagerly answers the questions at the end. Her favorite story is about Daniel in the lions’ den. She enjoys helping other children learn, and has two brothers and two sisters. Irina, who is 9 years old, loves to hear the exciting mission stories and Bible stories. Her favorite is the story of Jesus’ birth. Irina has three brothers and three sisters. The parents of the children coming to the branch Sabbath School are interested in learning more. A few of them come with their children, but most feel shy about coming, so the Adventists go to their homes to study with them. The parents are happy about what the children are learning, and were especially happy when their children received beautiful Bibles with pictures. One Bible was given to each family. These Bibles were provided by a previous Thirteenth Sabbath Offering. One mother was so happy that she cried when she saw the pictures. Many of the people in this village don’t know how to read, but with the pictures they can still learn and remember the stories. Many more villagers are now asking for the Bibles. They are eager to learn more! The Adventists are hoping to build a lamb shelter in Ngalitatae. They have been praying about it and have bought some land. Now they’re looking forward to receiving part of the Thirteenth Sabbath Offering for this quarter which will help the children in Ngalitatae have a place out of the rain where they can learn more about Jesus. Thank you for remembering to bring your special Thirteenth Sabbath Offering!